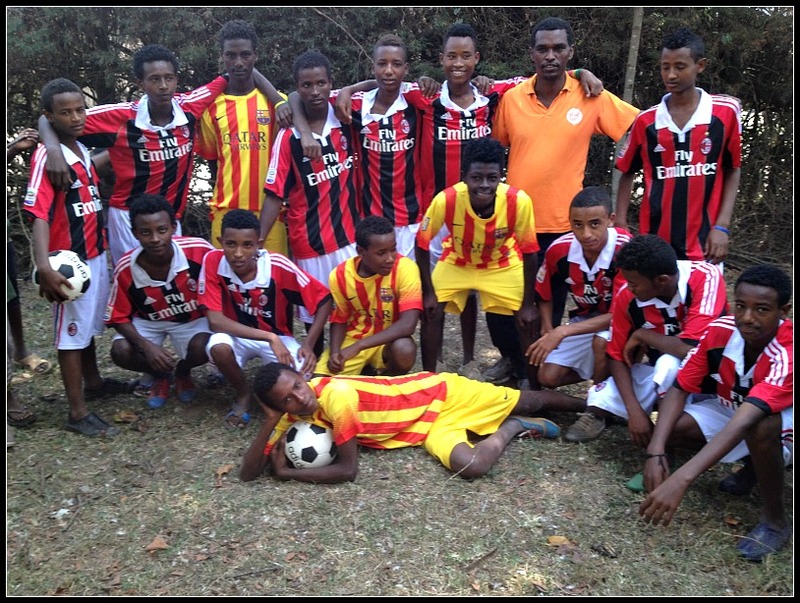 Sports Project Gets Vulnerable Ethiopian Youth Up and Running! We are proud to announce the Shone Youth Sports Project in Ethiopia. This project was inspired by an amazing young boy who adored sports. In his honor, the project will be instrumental in helping children in his home village of Shone, Ethiopia have the opportunity to participate in organized sports. The project has been underway for a few months and has been a great success. The Shone Youth Sports Project is a community-based initiative designed to assist vulnerable young people to become involved in sporting activities, develop their personal skills, and gain positive insight and motivation for education. The project provides material assistance to both boys and girls with good sports skills who would otherwise not be able to pursue their passion for soccer due to severe poverty. The project design is organized to help these young people engage in nurturing activities that will assist their self -confidence and community connections. The ultimate goal of the project is to leverage organized soccer to help mentor and guide these young people. School sports programs motivate children to enroll in and attend school and can help improve academic achievement! 40 young people (25 boys and 15 girls) were selected in Shone, Ethiopia (Hadiya Zone) for this project. The youth are now playing soccer together – outfitted fully with uniforms, equipment, a certified coach, and regular playing time. The teams are organized to compete locally and outside of town against other organized soccer teams. Sport can cause positive shifts in gender norms that afford girls and women greater safety and control over their lives! We are so excited about these teams and their future on and off the field! Participants, volunteers, and coaches acquire transferable life skills which increase their employability! Please email us at info@rootsethiopia.org for more information about the Shone Youth Sports Project. To support to our community-based projects in Ethiopia, please set up a recurring donation to our general fund. Your continued support allows Roots Ethiopia to continually strengthen our commitment to vulnerable Ethiopian communities. Did you find this post informative? Please share it by clicking one of the share buttons below!